When you need to measure extreme temperatures beyond the range of ordinary sensors, or when you need to measure temperatures in enclosed spaces or in liquids, a thermocouple is just what you're looking for. 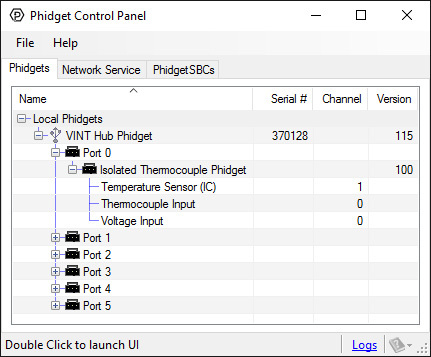 With one VINT port on your hub, you can interface a J, K, E or T type thermocouple, chosen in software and converted to degrees Celsius automatically (See the Connection & Compatibility tab for a list of VINT Hubs). If you have other thermocouple types, you can open the channel in VoltageInput mode and convert to Celsius manually using a formula; See the User Guide for more information. 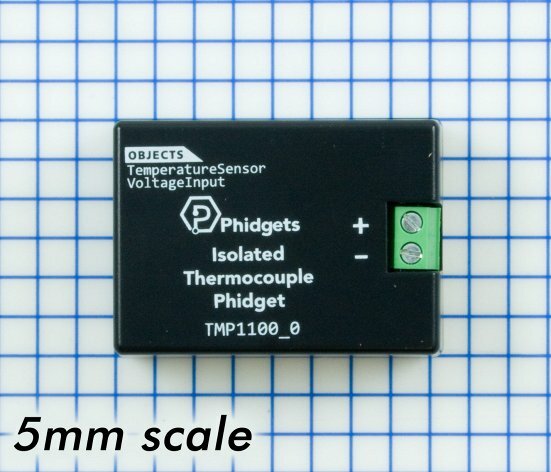 This Phidget is electrically isolated, allowing you to measure electrically noisy solutions (for examplle, a tank of water that has an electric pump running inside it). If you don't need isolation and want more thermocouples per VINT port, have a look at the "Other Thermocouple Boards" tab. 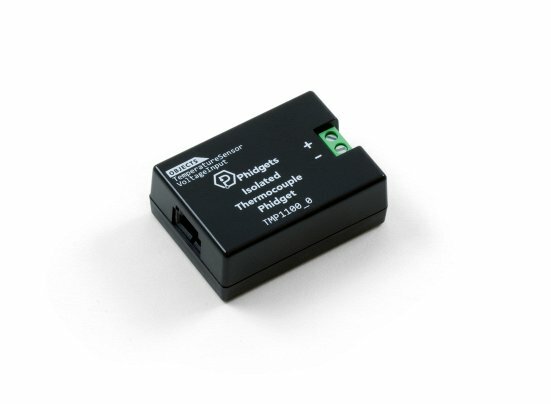 Connect the thermocouple to the inputs on the TMP1100. 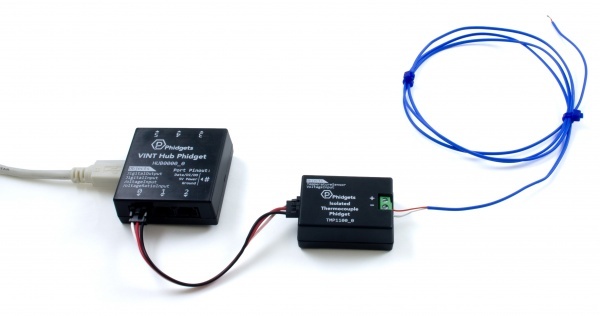 The datasheet or product page for the thermocouple should tell you which wire is positive and which is negative. Now that you have everything together, let's start using the TMP1100! In order to demonstrate the functionality of the TMP1100, the Phidget Control Panel running on a Windows machine will be used. Linux users can follow the getting started with Linux guide and continue reading here for more information about the TMP1100. 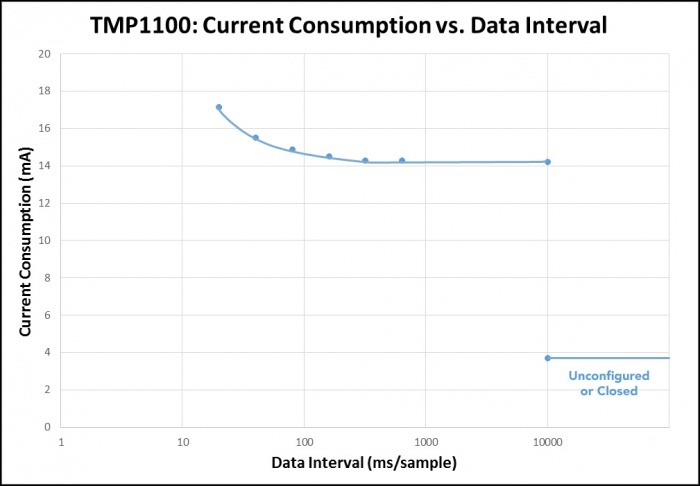 At the shortest data interval (20ms), it consumes around 17mA of current. At longer intervals, it dips to around 14mA. When the device is unconfigured or closed, it consumes approximately 4mA of current. Closing the object and reopening it can provide significant power savings for applications where the temperature only needs to be measured occasionally.